If you’re going away for the Easter Holidays, now is also a good time to clean-up debris and other mess created by fallen branches and leaves. So, whether it’s a taking a trailer load of garden waste to the tip or a hiring a ute to pick up those larger items from the hardware store for your DIY jobs, then U-Haul Australia can help! With over 1,000 U-Haul trailers for hire locations across Australia, there’s a range of different trailer options to suit your needs and requirements. We hire the following trailers with measurements for each listed at www.uhaul.com.au. In addition to trailers and utes, we also hire lawn mower, Car Carriers, Motorbike Trailers, horse floats and fully enclosed furniture vans for moving large loads of household items. If you are planning a trip away this Easter, but don’t have enough boot space to fit all your stuff, why not hire one of our “Vacationers” – a compact and lightweight trailer that can carry all those extra bits and pieces. U-Haul is the only trailer hire company in Australia to offer a truly ‘live’ self-booking system for both local and one-way hires. This means customers can easily book online 24 hours a day, 7 days a week! 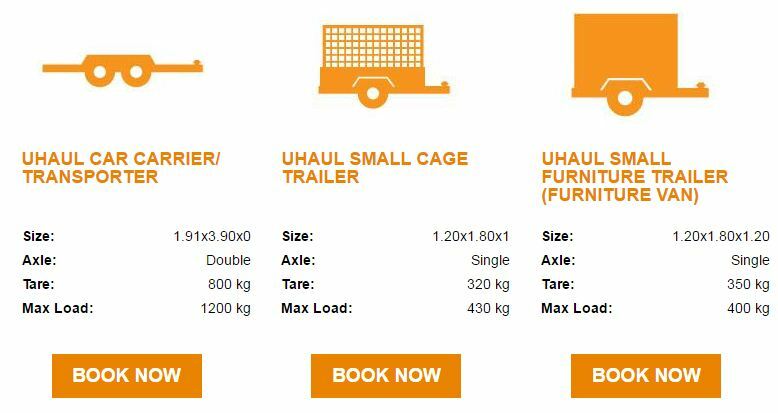 Australia Wide Trailer Rentals – UHAUL is the fastest growing trailer hire organisation in Australia. Our vision is to lead the trailer hire industry and ensure a prompt, safe and reliable service for anyone looking to hire a trailer anywhere in Australia (trailer hire Geelong, trailer hire Sydney, trailer hire Melbourne, trailer hire Perth, trailer hire Newcastle and more).